The sound of the dominant 7th permeates many classical, romantic sonatas and concertos of all instruments. The notes of the dominant seventh scale or chord are employed in many works for the violin and the rest of the string family. They are used in technical studies, and are also a requirement for examinations. A dominant seventh scale for graded exams is made up of the root, major third, perfect fifth and the flattened seventh. In the key of D the notes would be A, C#, E and G being the flattened seventh. The dominant of D being A as the root note. Their corresponding finger patterns are used so frequently they must be thoroughly assimilated in all keys. This will give an excellent geographical knowledge of the fingerboard. The violin dominant seventh can be found throughout each scale section of the Crabbers Scale Manuals. When the student is not so familiar with this type of scale, it is advisable to begin practising with the lower scales i.e. G first.This being in the key of C. From B to F sharp, the dominant 7th scale will have the same fingerings. Using these finger patterns will improve facility and memory more quickly. The dominant 7th scale should be practised in conjunction with all the other scales. This will give the student flexibility, and will almost certainly improve their technique. These finger patterns will be recognised more readily and will improve sight reading capabilities as well. The violin dominant seventh is happier sounding than its diminished neighbour. In many cases this allows the student to hear and assimilate the scale more readily than perhaps the diminished triads and other broken chords. The notes of the dominant 7th chord should be practised in conjunction with all the other scales. 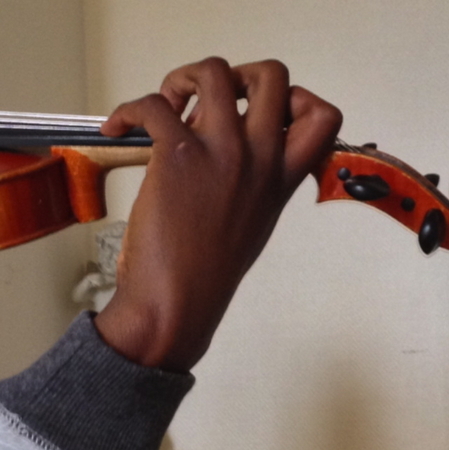 It is crucial that the violinist is taught how to practice scales. Regular work using the scale chart on page 169 will enable various practice methods to emerge.